The TTP223 Touch Key Module is based on a touch-sensing IC (TTP223) capacitive touch switch module. A capacitive touch sensor module based on the dedicated TTP223 touch sensor IC. The module provides a single integrated touch sensing area of 11 x 10.5mm with a sensor range of ~5mm. An onboard LED will give a visual indication of when the sensor is triggered. When triggered the output of the module will switch from its idle low state to high (default operation). Solder jumpers allow for reconfiguring its mode of operation to be either active low or toggle output. 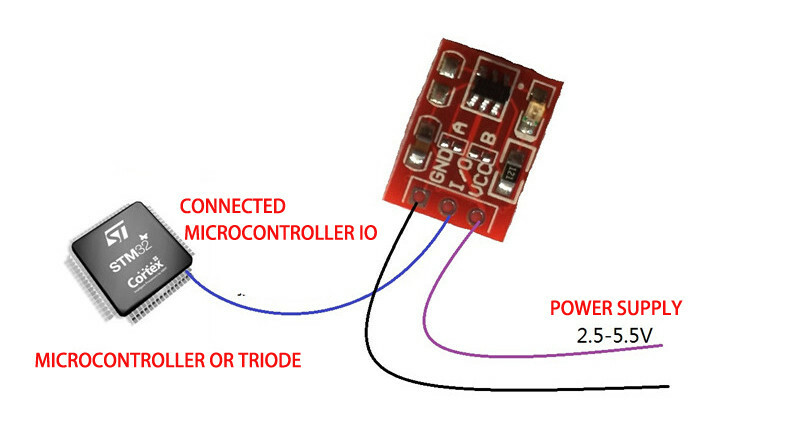 TTP223 Capacitive Touch Sensor Module. The TTP223 is a touchpad detector IC replicating a single tactile button. The TTP223 is a touchpad detector IC replicating a single tactile button. This touch detection IC is designed for replacing traditional direct button key with diverse pad size. Input Voltage : 2 Volt – 5.5 Volts DC. Stable touching detection of the human body for replacing traditional direct switch key. Provides direct mode?toggle mode by pad option(TOG pin). Have external power-on reset pin(RST pin). After power-on have about 0.5sec stable-time, during the time do not touch the keypad, and the function is disabled. Re-calibration period is about 4.0 sec when the key has not be touched.